Home / Latest / Nike Dynamic Fit Collar Boots – Whats the Difference? Nike Dynamic Fit Collar Boots – Whats the Difference? First there was Magista, then came Hypervenom and Superfly. 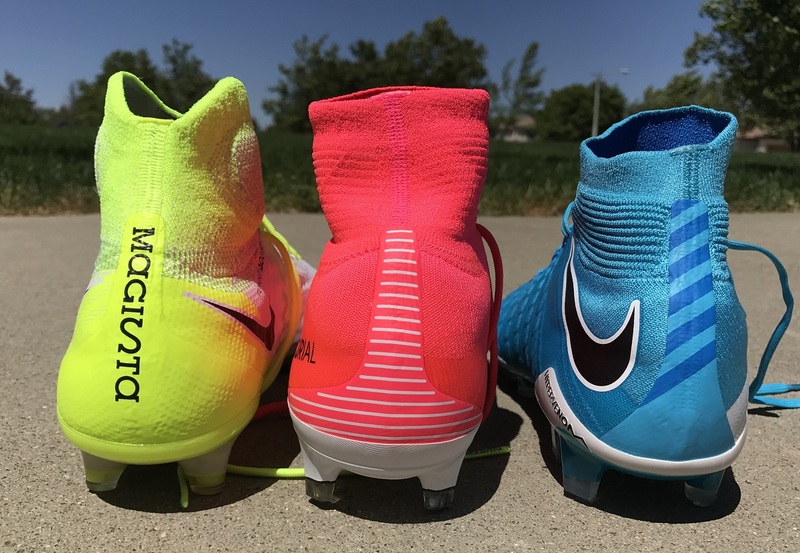 Each of Nike’s three key silos feature a higher cut, dynamic fit – or DF – collar, intended to create an “as one” connection between boot and foot. But what you might not have known is that each features its own uniquely distinct cut, intended to perform in unison with the style of boot. What that means is that players now need to factor in the cut when determining the right boot for their playing style. 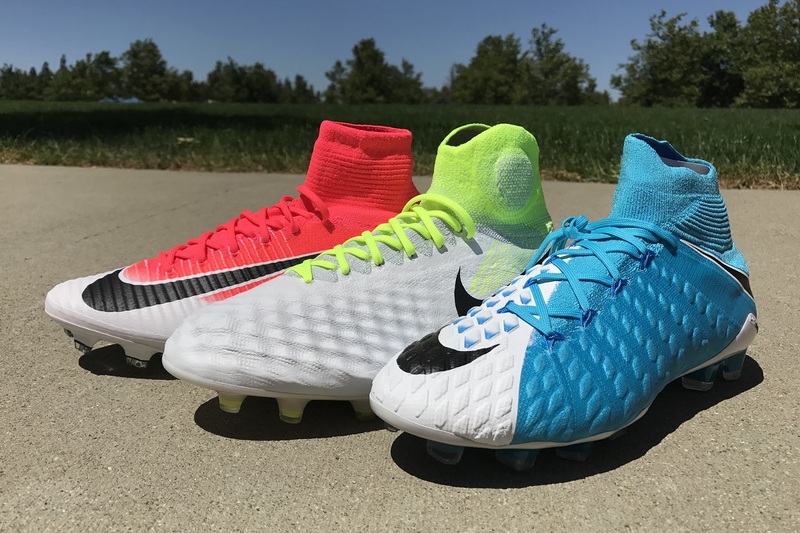 To help you out, we have taken the Magista, Hypervenom and Superfly from the recently released Motion Blur Pack and summarized below what you can expect from each. You can see from the images alone how each has evolved over time. Ideal For: Feeling uniformly locked in without areas of pressure. Nike has gone with a more anatomically contoured Dynamic Fit Collar on the second generation Magista Obra. From a side view, you can see how they are designed to accommodate the rounded shape of the ankle bone while leveraging a thicker knit structure for additional coverage. This allows them to contour your ankle more efficiently, and as a result we found that it was the most comfortable out of the trio. Also worth pointing out is that Nike revamped the collar so that it also dips lower on the tendon, reducing stress in the area. Highlight: Most Controlled Ankle Movement. Ideal For: Having some support through quick turns without feeling restricted. On the Hypervenom, Nike has basically sliced the collar down from inside to outside of the boot at somewhere around a 45 degree angle. They have then tailored the material so it has more stretch along the ridged knit area, and it is tighter along the top lip region. This means that in play, they stay tighter toward the top, while allowing for additional stretch as your ankle pivots. In play, you definitely notice it. I enjoyed the feel and didn’t necessarily want out of the boots because of the cut. There was also no pressure on the Achilles, something I had noticed with previous models. BUT, I’d still choose the Magista collar over this one. Ideal For: Feeling Connected to the boot as you accelerate. The Superfly is the only boot that features the original style dynamic collar. It’s purpose is to create a better fit and a heightened sensation of the boot as an extension of the foot. Even with their structured fit around the ankle, they are still super easy to slip in and out of while maintaining their shape. Through wear, however, I’ve found that my Achilles feels “tired” as the material tends to reduce the angle of stretch I get through accelerated movements. During play it isn’t a big issue, but after taking the boots off my Achilles region feels like it is slightly bruised. Realistically, each boot is going to provide players with different types of performance. 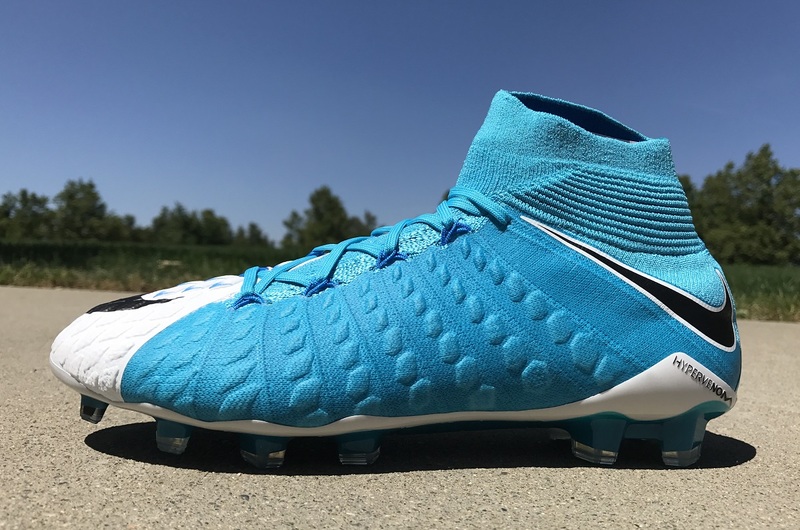 And since, for example, the Superfly is designed to be a tighter fitting boot, the snug fitting collar makes sense. 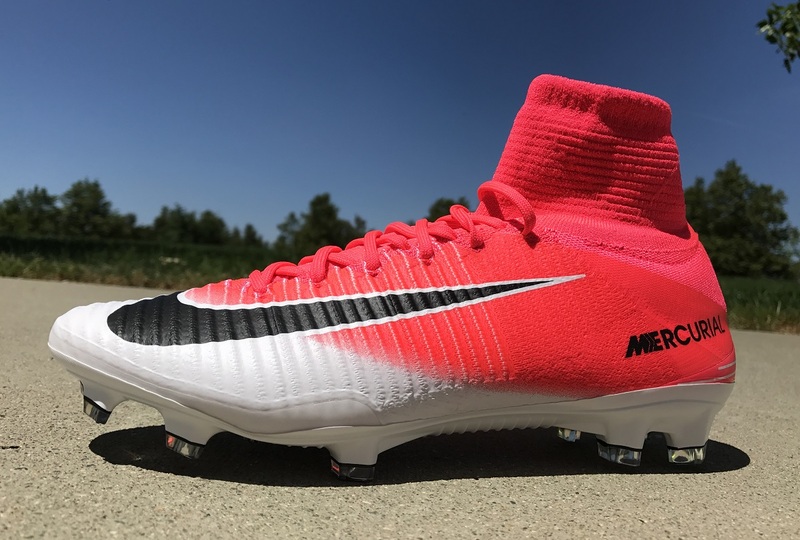 I really enjoyed the angle cut on the Hypervenom, as it has a more natural feel with a looser feel as you look to chop and turn from quick spaces. But it is the Magista that shines as the most effective. Its dynamic collar provides the best ft, with the material forming and contouring more naturally than the others. 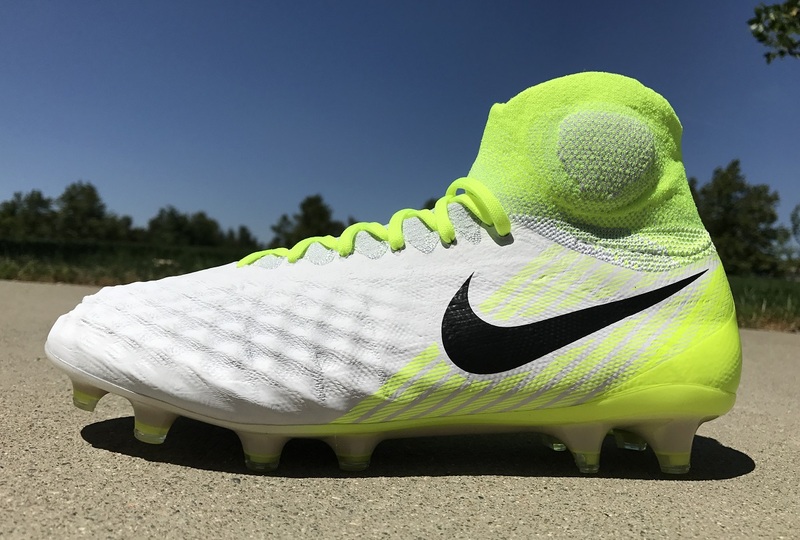 If you were looking for a version to go for based on the effectiveness of the collar, my recommendation would be toward the Magista. Find everything Motion Blur currently available at soccer.com. What are your thoughts on the collars and which version do you think works best? If you have tested any, let us know how they perform in the comments below. Why do we need an extra sock on top of socks? My son hates them as they are impossible for him to put on or take off. There is no real support like high top basketball shoes as they are soft fabric. The result is there are far fewer non-sock choices. Why?? Each boot is released in a high and regular cut collar, so just look for the regular cut options!